On Wednesday night at the airport it seems that the world has changed. When I entered the boarding gate the room was empty or nearly. This is what one month of media howling have done! The news have been exaggerating so much the radioactive situation here in Tokyo that the whole world has the feeling that Japan is forbidden to go to. Once again I do not try to minimize the gravity of what happened but as Takamatsu sensei said: “By opening his eyes and his mind, the ninja can responsively follow the subtle seasons and reasons of heaven, changing just as change is necessary, adapting always, so that in the end there is no such thing as surprise for the ninja”. So following Takamatsu sensei’s words please adapt to the misinformation and learn to read where the real dangers are. Fukushima Daiichi is a real problem but the radioactivity in Tokyo is far under the limits. Actually it is well under many other areas in Europe. 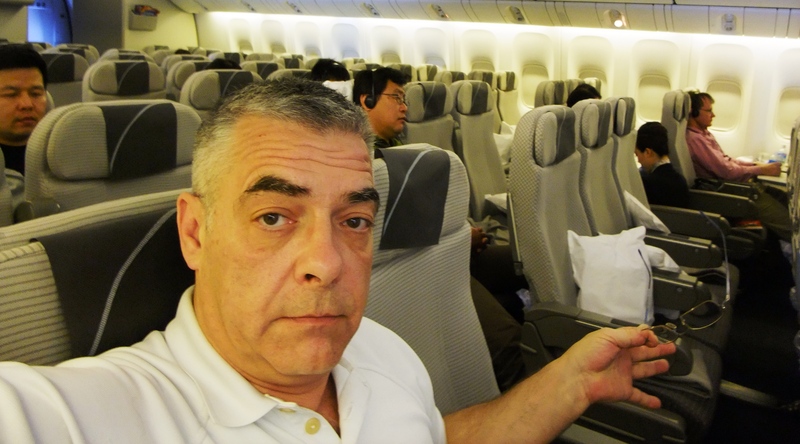 The plane, a Boeing 377-300 – no doubt the best flying machine in the sky these days – also was empty. I could have guessed it, though! and it reminded me of my early business years where I flew back from the Middle East one night with only 13 others persons. I love empty planes. A B-777/300 can host 272 passengers and needs 13 crew members and 3 pilots to operate. We were 108 passengers traveling which, apart from the Buddhist symbol of 108, represents more than 1 stewardess per person! and JAL doesn’t stop in Seoul for obeying some pilot union (add 2h to your flight) and arrived on time 11 hours and a few minutes later! It was like being a VIP or living in some kind of a dream. Only because of the “nuclear terror auction” spread by the media since the catastrophe. For weeks they were not speaking about the 260000 people that lost everything but about something that sells more: “the terrible nuclear accident”. They got so much our attention that in the plane there were only Japanese people and nearly no one from Europe going to Japan and I guess that it will not change soon. So if you want to train with a small group of buyu; if you want to enjoy calmness; and if you want to save money on your flight then do not hesitate, come now to Noda as this is the opportunity of a lifetime. Training bujinkan is about learning to make good choices in life. Did you make a good choice recently? Previous Post Japan: Stop Howling, Act! this mail is just to thank you for your step forward to lead Hatsumi to Europe. And your step has (in my opinion) the best reasons ever: to save his life and the life of his family! That this man said no, may be a result of his own contitioning. He ist a real Japanese and he is a real man! But there might be reasons I and others do not know. Beside this – there are reasons to change the geografic place. You offert something and at this time it gave no positive answer. But your reaction was mine too! I am no person in the hierarchy of Ninjutsu! Never! But I had and i have it in my heard! First was (knowing, that there is no string directly to Hatsumi) asking owners of dojos over here to make them sensible to this prob. Ok, I got the same reaction: please do not disturb the rules! But dispite of this – i feel deep insite that you felt like me – and the best of all: you did it! You asked and you was strong enough to offer! With this mail I just want to send you my deepest compliment! And – in mind the time – I hope, that Hatsumi will understand the real prob.